Brunno Ristow, M.D., F.A.C.S. (October 18, 1940) is an American plastic surgeon, author and teacher. He practiced in San Francisco, CA for 40 years. 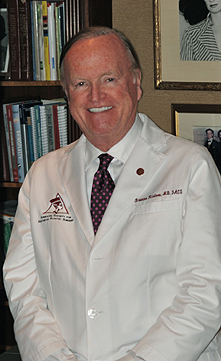 He wrote several chapters of professional surgical textbooks as well as articles in specialty journals. He also lectured extensively at the American Society for Aesthetic Plastic Surgery (ASAPS) and medical schools both national and international. Dr. Ristow was named to the Best Doctors in America ® list starting in 1992, an honor accorded to only 5% of physicians in America. Dr. Ristow retired from practice in 2013. To navigate this website please refer to the links on the left.